The album kicks off with the title track, I'm Livin' On, and this first song sets the pace for the rest of this easy listening, written from the heart, album. Through all fourteen tracks, it isn't so much the music, as it is the lyrics, that grabbed me. 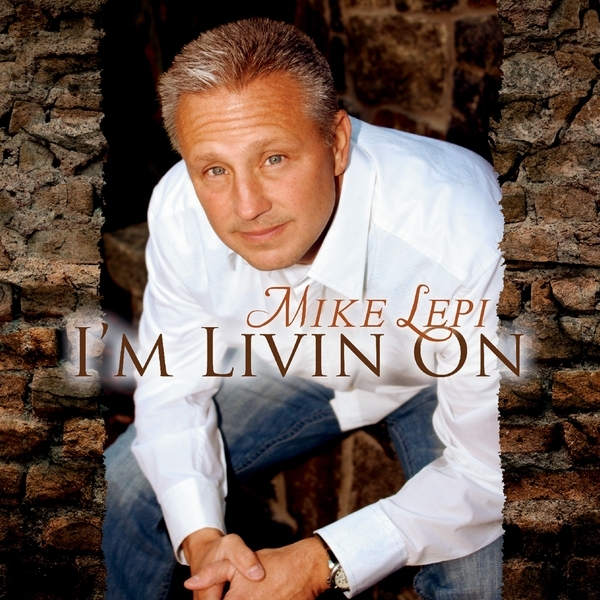 All songwriters will tell you their songs are inspired by events in their own lives, or the lives of those close to them, but not all songwriters can clearly convey their lives, lyrically, the way Mike Lepi does on his debut album. The first three songs are up-tempo tunes that celebrate life and loving but the fourth song slows things down with "I Love You More". Seriously now, is there anyone reading this who hasn't said those exact words to someone in their lives whom they truly cherish! The fifth track, "Best of Friends", is a novel tune that Lepi wrote for his daughter and her friends. He actually used their real names in the song and he says that even though many years have passed since he wrote it, he can still get a smile from his daughter when he sings this song. He wrote the next song when he lost his mother and you can certainly feel his pain as you listen to him sing "If You're Not in Heaven". But just as you reach for the kleenex, "Never To Late" hits the speakers and this drum driven tune will certainly lift your spirits. This is followed by "Too Much Fun", which is exactly the right amount of fun, in fact, this is one of my favorite tracks. There is some really good pickin' going on in this song and I love the lyrics. The next song "Fallen Hero", slows the pace way down. The song is a beautifully written tribute to those who have lost their lives while serving our country as police, fire, or soldiers. The very next track is an uptempo, philosophical tune that urges everyone to "Enjoy the Ride" and this is followed by, "The Internet", which is definitely another one of my favorite tracks on this album. It is so cleverly written, and the lyrics are delivered by a smooth pedal steel. Anyone who has ever gone online is certain to relate to this song on some level. The next song is just as it implies, it is about freedom in America. In the cut-by-cut Lepi writes, "'Freedom' is just what it says, we live in the greatest country on this planet and we need to embrace our freedom and those who defend it." As a veteran who is married to a veteran, this song certainly spoke to me, so I couldn't agree with him more. The final track was written via a request from Lepi's daughter. She, along with some of her classmates, requested he write a special song for their high school graduation. Like any good father (with his musical talent) would do, he wrote "Never Forget". He says he didn't really think the school would let him sing at the graduation ceremony, but much to the delight of his daughter and her friends, they did. There is a bonus track on this album, which means there are fourteen songs in all. The bonus track is a special song he wrote for his wife. The title says it all, "Christmas Memories". The most poignant lyrics refer to the reason we celebrate this holiday. Like all of the songs on this album, you can tell they are written from the heart. Shortly after finishing his first album, Lepi stated, "As a musician, I’m an infant, but I plan on growing fast and furious. With the help and support of many friends and family, my goal is to touch the lives of as many people as I can through my music." After listening to the fourteen tracks on this album, I can honestly say, "mission accomplished." If you stop by Mike's Reverbnation page, be sure to pick up your FREE copy of "Too Much Fun".